DIY Up-Cycling week continues with another organization tip. So far this week, I’ve shown you how to turn a cabinet door into a shelf, and how to use upper kitchen cabinets to create an organized work space. Today, I’ll show you my favorite way to organize all the small things in your work area: by using recycled jars! Maybe it’s a little depression-era mentality of me, but I get excited that so many groceries come with a bonus: durable storage containers! If you’re like me, you have certain staples that come in glass jars. This consistency is perfect for creating a collection of glass jars to use as storage throughout your home, as over time you’ll create sets of matching jars that look neat and organized when displayed together. The bulk of my “collection” revolves around a certain brand of salsa and organic tomato jars, with the occasional small jam or olive jar. I like to save the ones that have an interesting shape (like Stirrings cocktail mixes) to use for drinks, vases, or home decor projects. For my husband, Marc‘s, home music studio, we needed an attractive way to organize lots of small guitar parts and pieces. While they just looked like a hot mess when thrown into a drawer, the pieces actually had very interesting shapes and colors due to the variances in their age and brands; I found them to be even more of an interesting display because they aren’t objects you out in the world every day. We split things by type, and if there were only a few, by similar use. Bridges in one, and bridge accessories (springs, bolts, etc) in another; knobs together in one jar, pots in another. My favorite jar is the one full of knobs, I think the varied colors and types are so interesting! This type of storage can be manipulated to be used in any part of the home! Collecting a variety of sizes helps find the perfect shape for any objects you need to gather together. You can recycle jars for pantry storage, or in your home office to organize erasers, paper clips, pens; for kids glass jars are a nice way to display a collection of fun gel pens, or crayons, or marbles and jacks. And if you’re lucky enough to use grocery products stored in mason jars, your possibilities are endless! Look into companies such as the Cuppow!, which turns your jar into a lunch box, or Ecojarz to find fun drinking tops. How have you reused and recycled glass jars? What would you organize with them? Thanks for checking out DIY Up-Cycle Week! 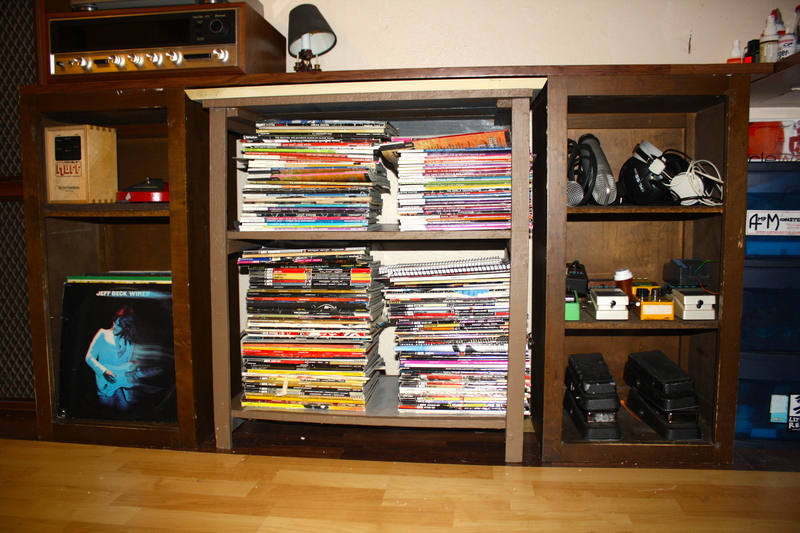 On Day 1 of DIY Up-Cycling week, I posted (here) about recycling a cabinet door into a shelf. 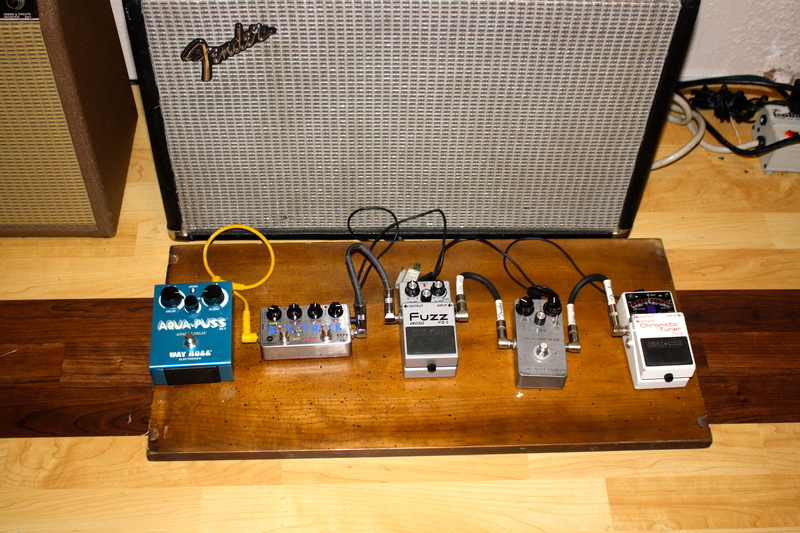 That was just the beginning of our make-over of a cluttered corner of my husband, Marc’s, small home studio. 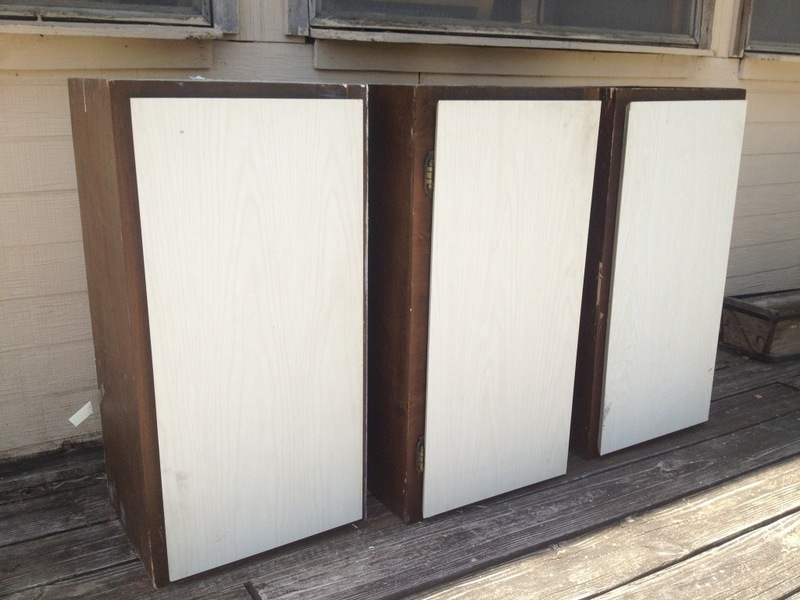 A visit to the Habitat Home Center unearthed some awesomely 70’s, two tone kitchen cabinets. After some digging around the used cabinet section, we were able to create a set of 3 matching cabinets, both in design and size! Price: just $20 each! We brought them home and Marc cleaned them up a bit. We took the color scheme and ran with it, basing Day 1’s paint colors on blending in with our “new” cabinet purchase. Habitat Home Center has a large and ever changing variety of used cabinets, in multiple size and colds, as well as from many eras! Be sure to bring a tape measure with you, and any measurements you have about the space you need to fill. Our plan was to make a corner unit workspace, with lots of storage and the ability to function as a counter for guitar repair, as well as a laptop friendly desk for recording. Because Marc planned to sit while working in this area, we decided to search out upper kitchen cabinets because of their shorter height. Since the studio is small in size (just 11’x7.5′), the shallow depth of upper cabinets was an added bonus in not taking up too much precious floorspace. Then we began assembling the organizational corner unit. We used one cabinet to anchor the right side of the narrow edge of the desk. 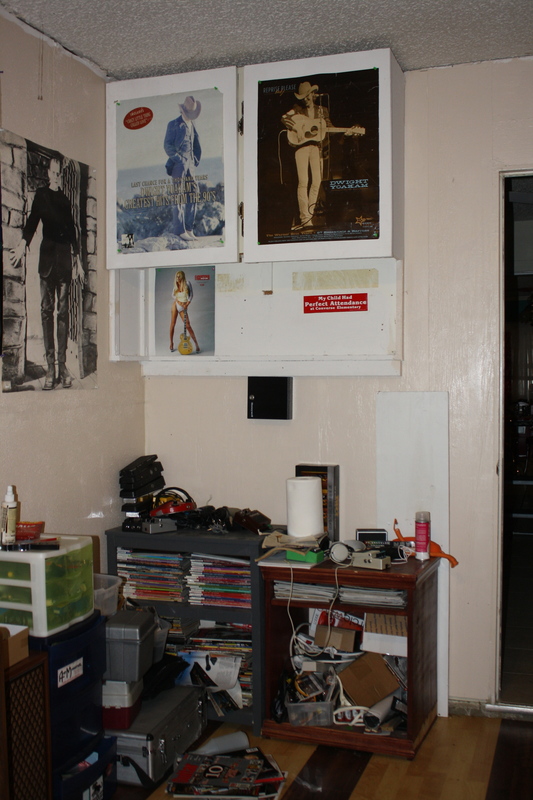 The cabinets measured 12″ deep; for the desktop we made use of a 12″ MDF shelf we had in the house already. A 10″ shelf bracket was mounted to the left of the cabinet to hold the other side. Be sure to use brackets or find a wall stud to mount it too. In staying with the 70’s faux wood theme of the cabinets, I used wood-grain contact paper to quickly cover the MDF desktop. We attached it by screwing the countertop onto the cabinet and bracket from underneath. Side one was done! 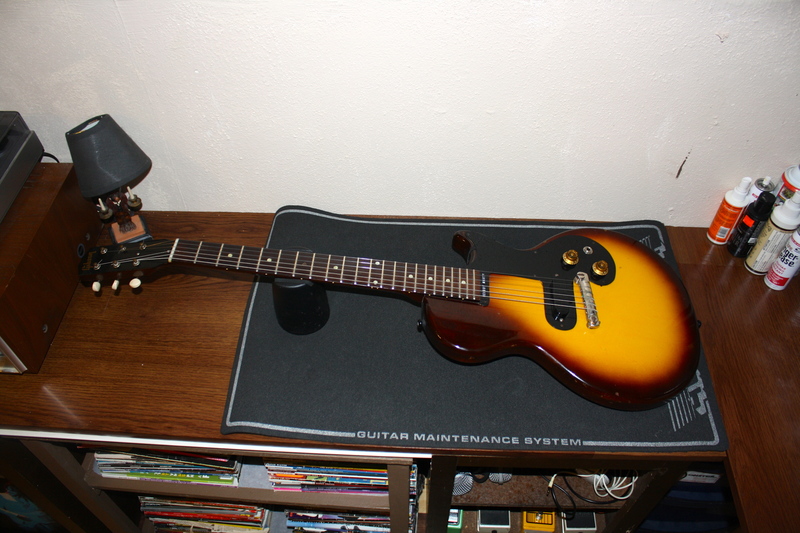 The opposite corner was to be deeper, to accommodate the width of a guitar as well as our vintage radio receiver/record player. We thought open shelving would be better, to allow quick access to supplies and records. Marc removed the doors from the remaining 2 cabinets, and set them aside to reuse later. 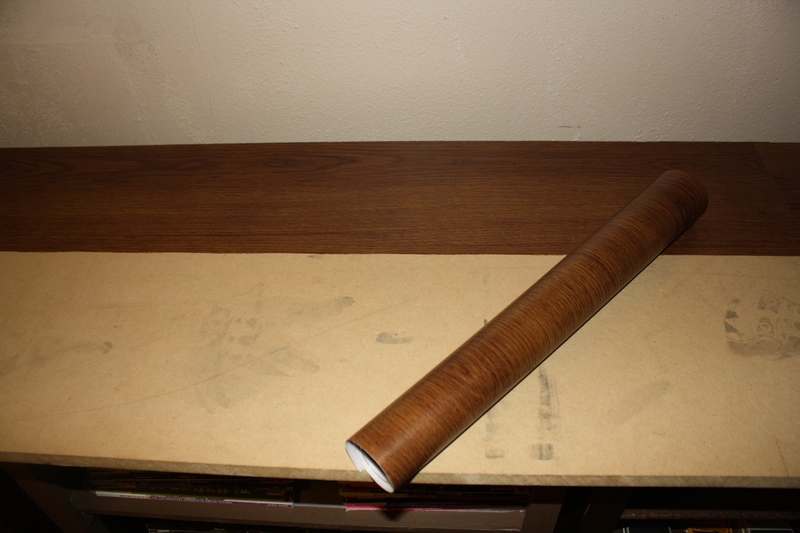 We used another piece of MDF for the counter top on the adjoining side, which was cut to 18″x60″ for us at Home Depot. It too was covered with faux wood contact paper. I set up the remaining 2 open faced cabinets with the front 18″ from the wall, with enough space in between the length of one of the cabinet doors (you’ll see why later). Marc and I sat the top onto the cabinets, and I held it in place while he attached it to the cabinets using screws from underneath. We painted a pre-existing bookshelf brown, and it fit perfectly between the two cabinets. Our open shelving area was complete, but we still wanted another desktop option for using a laptop. Remember when I mentioned saving the doors? We repurposed one into a sliding laptop desk! Using sturdy drawer glides, we were able to attach the door to the top of the bookcase, allowing it to hide under the counter when not in use. If you don’t need the extra desktop, the remaining cabinet doors can be used as well shelves above your desktop, or mounted between the cabinets under the desk as additional shelving there. 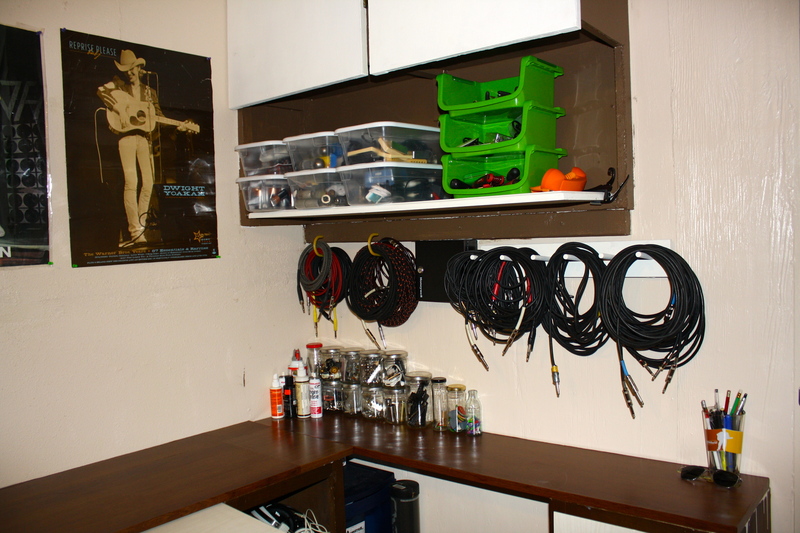 We added bicycle hooks and an old towel rack to the wall to organize cables, and seperated parts into smaller containers for easy access. 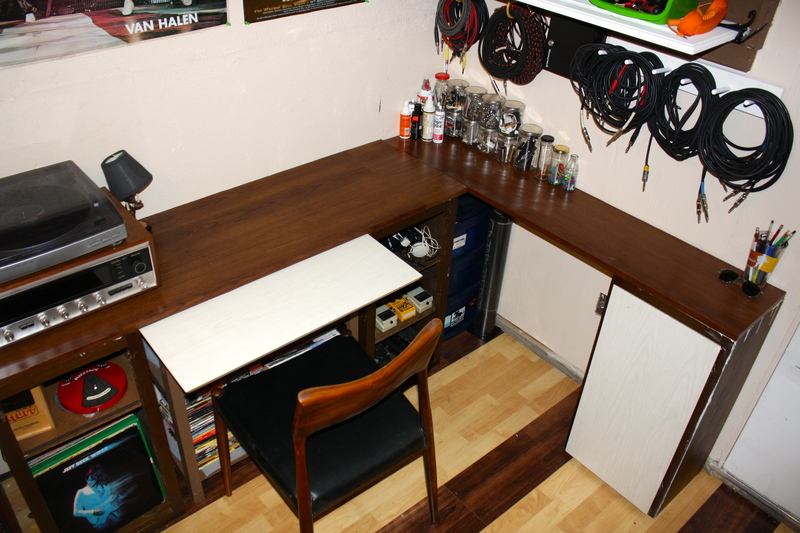 Creating this recycled workspace was cost effective and maximized the space in the room! We were able to remove 2 bulky pieces of furniture, and the pre-existing bookshelf is now nestled and functional. 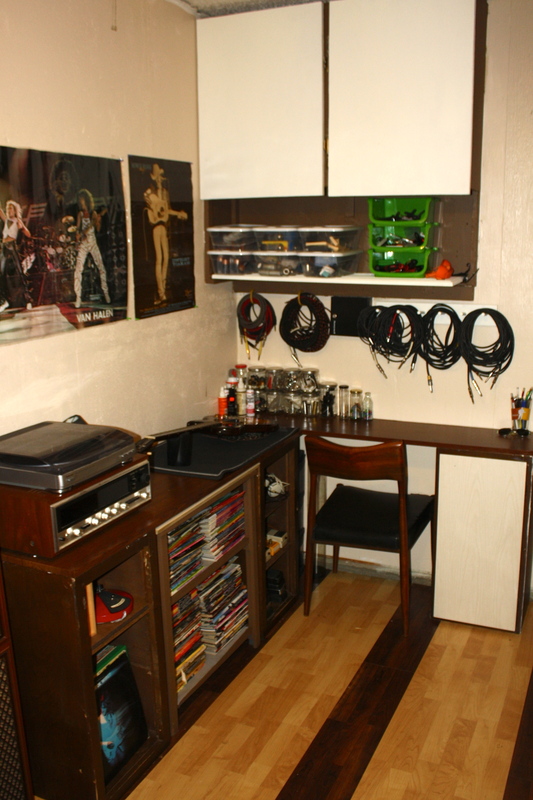 A small plastic drawer unit was tucked between the cabinet and the wall, allowing for more hidden storage; guitar pedals can be seen and switched out easily thanks to the open cabinets, and guitars can easily be maintained and repaired. The sliding “cabinet door” desktop allows for additional space, but only when needed, and we gained additional desktop space on the narrow side of the desk by leaving an opening wide enough for a chair (which BTW was a great, vintage $5 thrift store find!). I hope our adventures in recycling and repurposing has inspired you to look around your home for scrap pieces, visit Habitat Home Center, and create something new from something old! It’s easy to get organized using repurposed items, and if you are open minded you can take their unique styles (such as the vintage flair and colors of these cabinets) and use it as basis for a whole design! And if you’re curious about our striped floor, come back later this week to find out the how and why on it! Disclosure: This is a sponsored post. I received supplies from Habitat San Antonio, but all ideas, projects, and opinions are my own. A few weeks ago, I was invited to the Habitat Home Center to pick up a few supplies to create a functional up cycled project as part of their #DontTrashIt campaign. My husband, Marc, and I are no stranger to “Habitat”, as we refer to it, it’s one of our favorite places to go browse and we’ve already done one upcycled project from there (I’ll share about that later this week). We embarked on a 2 part process using the goods I received from Habitat Home Center. 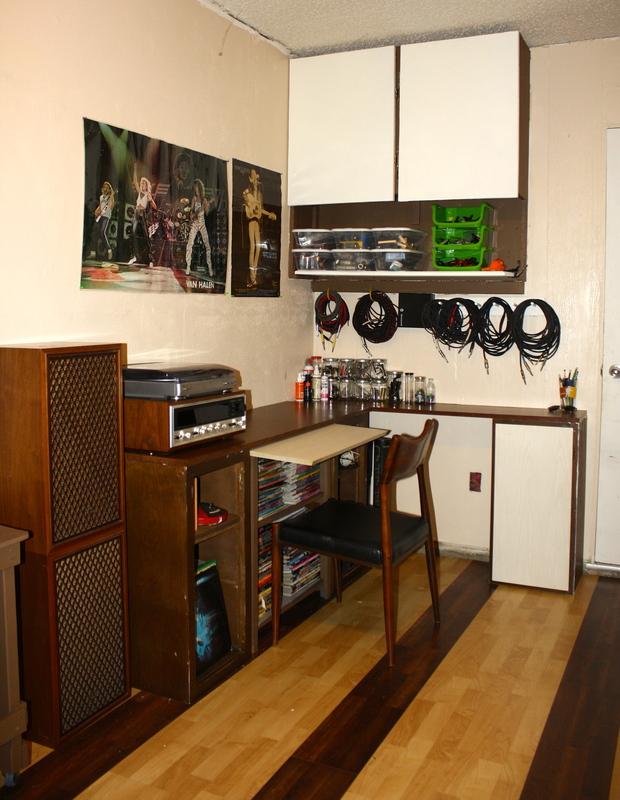 Our final goal: to create a functional work and storage center in Marc’s tiny (only 11’x7.5′) home music studio. Part 1: Maximizing the storage abilities of an existing built-in, and freshening it up. 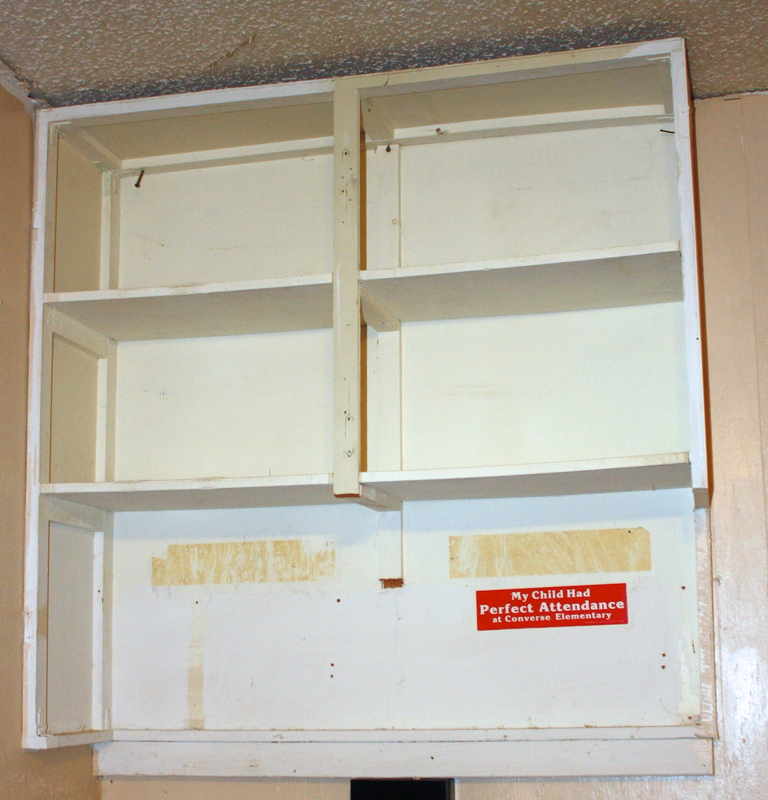 Here is the before: A faded cabinet and a weird, useless ledge of unknown origin (or reasoning). And yes-yours truly had perfect attendance once upon a time! 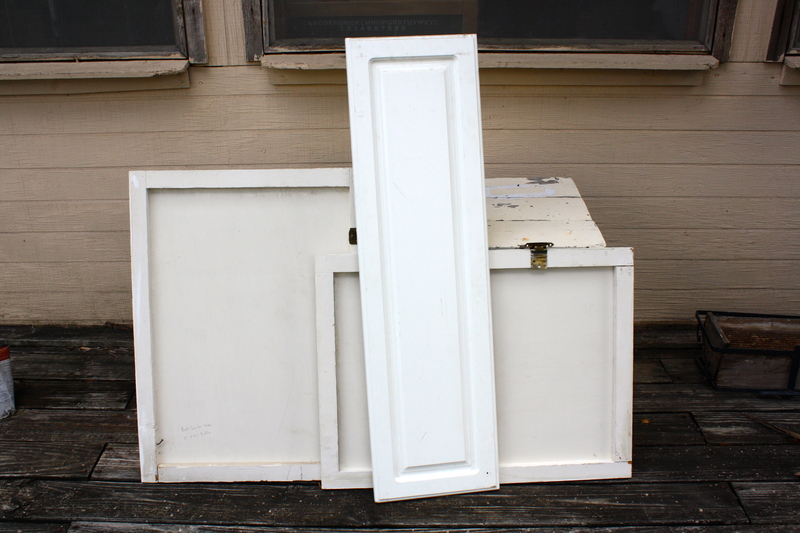 Habitat Home Center has a large selection of loose cabinet doors; many styles, colors, sizes are available. I found a long and narrow cabinet door that was the perfect length and width to fill the ledge below our existing cabinets. Price: just $3! SOLD! To make everything look fresh and cohesive with Part 2 of the project, a fresh coat of paint was installed. Marc removed the existing doors, and took them, along with our new recycled cabinet door/shelf, outside for a coat of paint. You can see the “new” door from Habitat in the center. 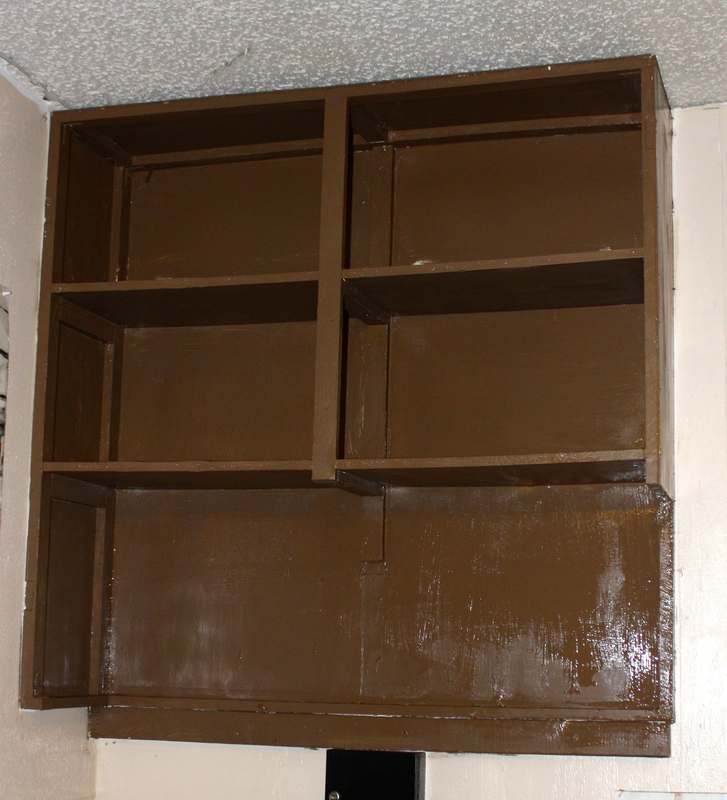 Inside, I put a fresh coat of chocolate brown paint on the remaining part of the built-in. I always check the “Oops” paints at Lowes and Home Depot, and pick up any colors that fit in with our tastes and existing color scheme. You can score gallons of premiums paints for just $5-10! The chocolate brown I’m using for this project was one of those finds. We also painted the entire studio for just $5, using another gallon of “Oops” paint! After the paint dried, it was time to reassemble. Looking back, Marc and I would now suggest you mark the doors left and right when removing them from home made pieces. We lost a few minutes debating which holes the hinges fit back into. 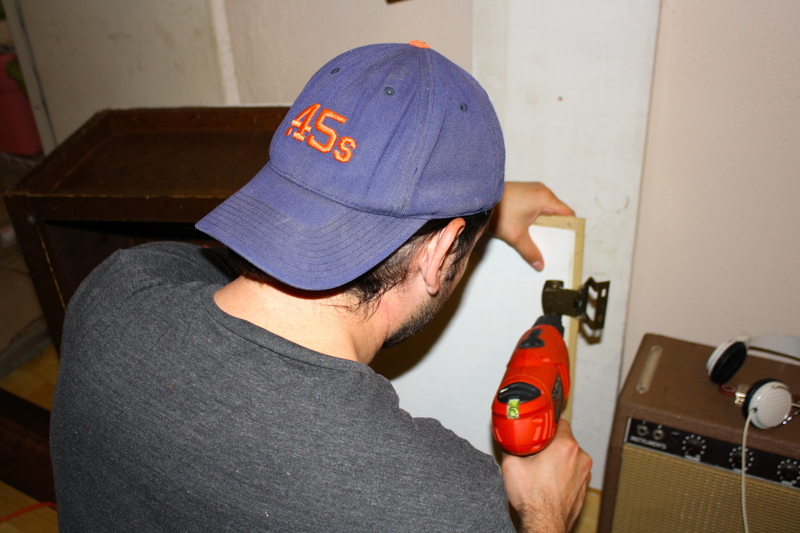 Marc used 3″ screws to attach the new Cabinet Door Shelf onto the existing edge (which was about 1.5″ deep, and was pre-existing on 2 sides), drilling them in from the top into the ledge. A quick trip to the dollar store provided some clear storage containers, and easy access bins to help organize our new shelf! 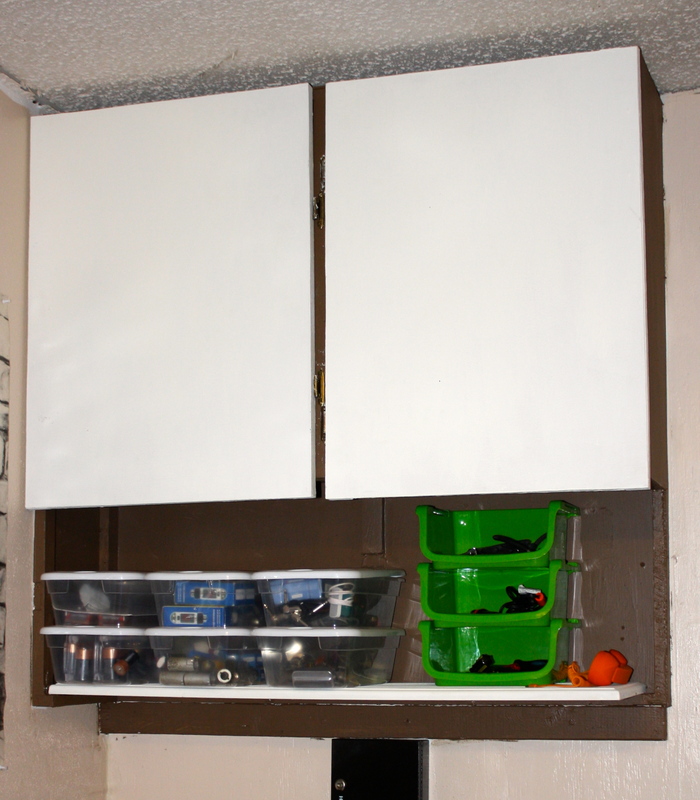 This project can also be replicated using any size cabinet door, and shelf brackets from any home improvement store. There are many options, from utilitarian to decorative. Most of the big stores have them in multiple locations (some in the building supplies, some with closet organization), so be sure to ask an employee to point them out to you if you want to find the full selection. There are two main advantages to re-purposing a cabinet door into a shelf. I found the selection of doors to have a large variety in regards to how the edges were finished: beveled, rounded, etc., which adds interest and detail to the shelf once it is up in your home. Second, price! How else can you get a shelf for $3-8? Many of them were solid wood, and many would not require any coats of paint or stain, just a good cleaning.